I’ve mentioned before that PDF files are a fact of life that sometimes are painful to deal with (manipulate and fix) and I truly dislike Adobe Acrobat. I’m pretty partial to Investintech’s Able2Extract products and Version 10 of both Able2Extract and Able2Extract Professional have just been launched. Recently, I was provided with a pre-release copy of Able2Extract Professional 10 and am happy to see some improvements and new features. One of the tasks I find myself wanting to do frequently is changing the actual printed text of PDF files (agreements/contracts/forms) before signing and submission. For me, the big new feature of A2E 10 is he ability to edit text in existing PDF files. While I won’t bore you with dull business contracts, I did take a peace of personal “history” and change a few things I thought could be better. When Microsoft released Windows 2000, they launched it with a “Geek of the Week” web feature and selected me as their launch Geek. I was interviewed and they published the article. AT the time, I wish I could have asked for a few changes. I didn’t like that the writer stated I blurted out a sentence and I didn’t like that they published more information about where i lived than I was comfortable sharing. (I also didn’t like the picture of me they selected, but that’s a whole other issue). Someone at Microsoft sent me the article as a PDF file and I’ve had it ever since. Reading the release notes on the editing capabilities of Able2Extract 10, I started experimenting on contracts and other business documents, but then remembered that I had a few more interesting things saved to PDF that I would love to revise. So I loaded the original Geek of the Week PDF in the editor. It took no time at all to highlight the text I wanted to replace and type in my correction. A2E automatically matches the type style and size, but I could easily have changed these. 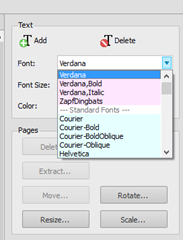 A2E lets me easily add, delete, or change text in a WYSIWYG editor. Painless and fast. The new version also offers to ability to convert ANYTHING to Excel (not just PDF) which I find interesting. And you can merge and extract PDF files. While I’ve always found that conversion with A2E is extremely accurate, I’m told that accuracy has been improved and enhanced in this new version. If you’re interested in world class OCR capabilities, the Pro edition lets you converted scanned, image based documents. The new editing capabilities for me is the best new feature. I like this tool and recommend it highly. Trial versions of both Able2Extract and Able2Extract Professional are available so you can see for yourself. Oh, and if you want to read the Geek of the Week article (revised), you can laugh at my predictions about the future.